If the New York Yankees broadcaster Mel Allen were calling the action on May 20, 1922, he might have queried his listening audience with his signature line, “How about that?” Yes, the first matchup of the visiting St Louis Browns and the Yankees was certainly one that was not to be believed. But it also provided a glimpse into the kind of pennant race that would take place in the American League that year. In future years each franchise would take a different path: The Browns would be symbols of apathy and empathy, while the Yankees would display signs of power and success. But on this day, in this season, the two teams were equally matched. New York’s starting pitcher, Sad Sam Jones, was cruising, leading 2-0 courtesy of an Aaron Ward two-run shot to the Polo Ground bleachers in left field. The Browns scratched for a single run in the eighth inning, but the way Jones was pitching, the 38,000 fans seemingly had nothing to fear, and with two out in the top of the ninth inning, it appeared that St. Louis starter Urban Shocker would be on the short end of a 2-1 score. Browns manager Lee Fohl went to his bench, and his pinch-hit selections proved fruitful as both players reached base. There was a runner on third base as right fielder Jack Tobin stepped up to the dish. He lashed a grounder down the first-base line. Yankee first baseman Wally Pipp fielded it and flipped to Jones, who was covering the bag. But Jones dropped the ball. The umpire mistakenly called Tobin out, causing a good number of fans to storm the field. Some of the Yankees and Browns retreated to their clubhouses during the commotion. But the umpire clarified his call, ruling Tobin safe, and a run scored to tie the game. Shortstop Wally Gerber came up and singled to right, scoring the go-ahead run. An intentional walk to George Sisler, then an unintentional walk to Ken Williams brought up William “Baby Doll” Jacobson. He unleashed a home run to left field, a grand slam. When all was said and done, the Browns had scored seven runs, all unearned, on their way to an 8-2 victory. 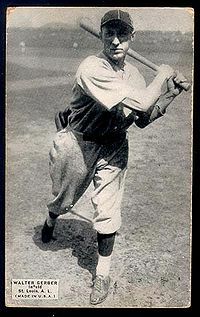 Gerber, who was noted more for his finesse with the leather than his work with the lumber at the plate, frequently came through with a clutch hit. It was a familiar sight in St. Louis that when the Browns needed a key hit, Gerber was the man Browns fans wanted at the plate. Walter Gerber was born on August 18, 1891, in Columbus, Ohio, the second of four children born to Edward and Margaret Gerber. Wally, who was nicknamed Spooks because of his skeleton-like frame, attended Southwood grade school through the eighth grade. He then dropped out to find work to help support his family. While playing shortstop in a semipro game in 1910, Gerber impressed the Columbus Senators’ general manager, Bob Quinn, with his defensive ability. Quinn, who was known as an astute judge of raw talent, did not waste any time. He signed the young infielder to a contract and assigned him to Akron of the Class C Ohio-Pennsylvania League. Under the watchful eye of manager Lee Fohl, Gerber honed his baseball talent. In 1914 the new Federal League posed a threat to the stability of the major and minor leagues by offering high salaries in order to lure established players. At Columbus, Quinn could not matvch the salaries. Pittsburgh Pirates owner Barney Dreyfuss, who had a working agreement with Quinn, agreed to purchase Gerber as a means of making him unavailable to the Federal League. The Pirates’ shortstop was Honus Wagner, one of the greatest in history, and a player greatly admired by Gerber. (“I never had any ambition to play at any other position but shortstop,” Gerber said. “Honus Wagner was my idol and that’s why I wanted to become a great shortstop.”2) At times Gerber got the opportunity to play alongside his idol when he filled in for Doug Baird at third base. Once the Federal League folded, after the 1915 season, the Pirates returned Gerber to Columbus, where he patrolled the shortstop position for the next two seasons. In 1917 Quinn and his partners sold their interest in the Columbus club, and Quinn became the general manager of the Browns. He bought Gerber’s contract late in the season, and Gerber started the last ten games of the season at shortstop for the Browns. The 1918 season was cut short for Gerber, who was called up for service in the World War as an Army infantryman. After the war ended, Gerber was discharged before the 1919 season, and he returned to the Browns. He solidified himself as the starting shortstop for the next six years. In 1920 Gerber was tops in the league in assists (513) and double plays (76) and second in putouts (288). Lee Fohl took over the managing duties beginning in 1921. The Browns responded by placing third in the American League. (It was their best finish since 1902, their inaugural season in the junior circuit, when they were runners-up to Philadelphia.) Gerber, who missed five weeks in June and July with a broken hand, hit a respectable .278 and drove in 48 runs. Reunited with Fohl, Gerber was part of a lineup that others around the league began to view with respect. With Sisler at first base, and an outfield of Jack Tobin, Baby Doll Jacobson, and Ken Williams, there was an ample supply of offense. Hank Severeid was a solid receiver behind the plate, and the mound corps was led by Urban Shocker and Elam Vangilder. In 1921, Gerber married the former Lauretta Langhauser of St, Louis. They were married 23 years, and did not have any children. Indeed, Spooks was handy with the bat, posting three four-hit games in May 1922. On June 4 his single in the bottom of the tenth inning gave the Browns a 3-2 win over the White Sox and put them just 1½ games behind New York. On June 16, as the Browns passed the Yankees, courtesy of a 14-2 shellacking of the Washington Senators, Gerber collected two hits and scored twice. But it was the Yankees who made the big splash on July 23 when they acquired third baseman Joe Dugan from the Red Sox. After the trade the Yankees faced off against the Browns in a four-game series at Sportsman’s Park. After Urban Shocker won the first game, 8-0, the Yankees won the next three to leave St. Louis with a half-game lead. Dugan collected five hits and walked twice as his addition to the Yankee lineup was immediately evident. The Browns, compiled a 93-61 record but finished in second place to the Yankees by 1½ games. Though they dominated the rest of the league (85-47), they were 8-14 against New York. Though they didn’t win the pennant, the 1922 Browns were generally thought of as the greatest Browns team of all time. Sisler won the batting championship with an astounding .420 average and led the league in triples (18), hits (246), and runs (134). Williams led the league in home runs (39) and RBIs (155). For his part, Gerber hit .267 and drove in 51 runs. Defensively, he led the league in putouts (322). For Gerber, the 1922 season was the closest he came to a World Series. Gerber had his best offensive season in 1923, establishing career highs in batting average (.281), hits (170), and RBIs (62). He set a record (since broken) by handling 48 chances without committing an error from his shortstop position. Fohl was replaced by Jimmy Austin during the 1923 season, and Sisler replaced Austin in 1924. Gerber’s season was cut short in 1925 when he fractured a bone sliding into third base at Cleveland on June 1. His replacement, Bobby LaMotte, was an adequate backup at the plate, but did not have the same range in the field as the veteran. Gerber returned in early August, but shared time with LaMotte. On October 1, as the Browns topped the Tigers 4-2 to clinch third place, Gerber got the key hit in the eighth inning to give the Browns the lead. Gerber continued as the starting shortstop in 1926 and 1927, as the Browns sank to seventh place both seasons. In 1928 Bob Quinn, who by now owned the lowly Boston Red Sox, sought an infusion of leadership, and talent, and dealt for Gerber and Ken Williams. “These two old-timers seem to play the game for the pure joy of it,” wrote one scribe. “They show more spirit than the players half their age. I imagine some day we will have to carry them off the field.”5 The statement was indeed prophetic. On August 8, 1929, Gerber was playing second base and went back on a ball as Williams came charging in from center field. Neither heard the other calling for the catch. They collided, each cracking their skulls. Both players were carried from the field, effectively ending their careers. He retired with a career batting average of .257, collected 1,309 hits and knocked in 476 runs. He ended his time in the major leagues with a .943 fielding percentage at shortstop, and registered 4,319 assists. Gerber tried to make a comeback attempt with St. Paul of the American Association in 1930. But after playing in 55 games he retired as a player. He did not stray too far, however, working as an umpire in the Mid-Atlantic League from 1935 through 1938. Gerber and Lauretta remained in Columbus after his playing days were over. They lived comfortably, as Gerber had saved much of his earnings. (Teammates occasionally chided him for being so good at picking up balls but never picking up a check for dinner.) In 1939 Gerber was named the men’s supervisor for the Columbus Recreation Department. He held the post for ten years, and was often credited with creating the first softball leagues around Columbus. Gerber died on June 19, 1951, after a heart attack. Lauretta had died in 1944. Posthumously, Gerber was inducted into the Columbus Clippers Hall of Fame in 1992. Godin, Roger A., The 1922 St. Louis Browns (Jefferson, North Carolina: McFarland, 1991). Huhn, Rick, The Sizzler (Columbia, Missouri: University of Missouri Press, 2004). Santry, Joe, “Wally Gerber – Columbus Hometown Hero,” Anchors Aweigh, May 1988. 1 Joe Santry, “Wally Gerber – Columbus Hometown Hero,” Anchors Aweigh, May 1988, 12. 2 Ford Sawyer, “Gerber Plays Important Part in Pennant Chase by Browns.” From Gerber’s file at the Baseball Hall of Fame. 3 Roger A. Godin, The 1922 St. Louis Browns (Jefferson, North Carolina: McFarland, 1991), 38. 4 The Sporting News, April 19, 1923.